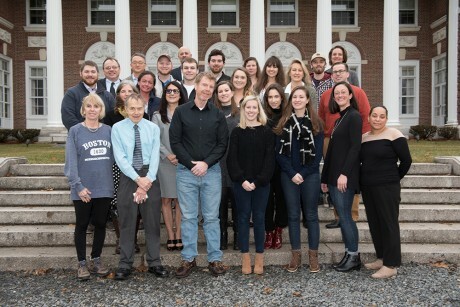 Now in its fifth week, our new master's degree in integrated marketing communications is in full swing with 25 part-time students being taught by three Stonehill faculty members, Program Director Lee McGinnis and Visual & Performing Arts Professor Eva Stanton, and Marketing Professor Kristin McGillicuddy. “We are off to a fantastic start and already there is real synergy between our students and their professors,” says Director of Graduate Admission Melissa Ratliff, who, along with faculty members, welcomed the new students at their orientation on Saturday January 13 before night classes began on Tuesday, January 16. With a focus on creativity, the interdisciplinary program blends marketing, communication and graphic design while giving students the option of completing their degree in as little as two years. Ratliff notes that the adult students vary in age, gender, background, skills, and professional experience. “Whether our graduates want to start their own business or run a marketing department, this program will prepare them to meet their goals,” explained Ratliff. A life-long learner, Melinda Rios, who works in the College’s Advancement Division, was attracted to the program by its emphasis on creativity. “I want to keep expanding my artistic and professional horizons and acquire new skills. I like the challenging classes, peers with great life experiences, and smart professors. Plus, I am impressed by the program’s dedicated resources and support for us students,” said Rios who graduated from Wellesley College in 2010. James Lynch was looking for a master’s program that would parallel the professional work he does every day for Masassoit Community College where he is the Director of Marketing. “It meets my criteria, attractive courses, near my home and ultimately a degree from Stonehill, which has a stellar academic reputation. In addition, the welcome and support from the program’s staff has been so smooth and helpful, one of the best experiences I have ever had,” he said. Geoff Lennon recently changed industries, and even though he’s still working in technology project management, his new role at W.B. Mason has brought with it a great deal of exposure to the Company’s marketing efforts. Thanks to company scholarships, 13 W. B. Mason employees are enrolled in courses and several of them are Stonehill alumni. Associate Dean for Admission Information Systems Geoff Smith enrolled for two main reasons. “It’s an important step in increasing my knowledge of the craft and advancing my career. I know that an advanced degree from Stonehill will open new doors for me. It’s also an opportunity to experience Stonehill as a student first-hand, which – as an employee responsible for promoting the brand – was an opportunity that was too good to pass up,” he said. With the first semester well under way, Graduate Admission Director Melissa Ratliff is busy recruiting for the program’s summer and fall semesters, including through two upcoming information sessions: The first on Saturday, February 24th at 1:00 p.m. and the second on Thursday, March 15th at 6:30 p.m.